Successfully Added UPnP High Definition Media Server - Wireless Media Streaming to your Shopping Cart. 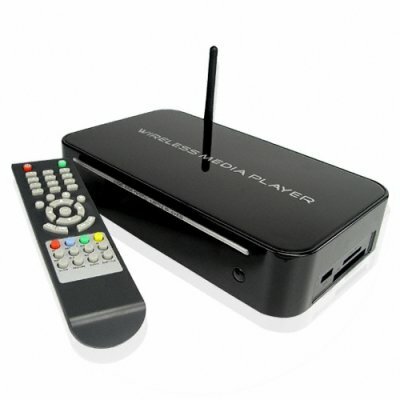 UPnP digital player for wireless streaming all sorts of media including embedded internet content to your TV. With this unit plugged in and configured to your home network either by LAN cable or WiFi 802.11g you will be able to stream content from computers on your network to a TV or projector. With added URL support the unit is also able to retrieve FLV files and other embedded from youtube and the like for your viewing pleasure. Compatible with a truly astounding array of media formats this is the best UPnP media client we've seen and is compatible with many well known media programs including, Microsoft Windows Media Player, Twonky Vison and Myth TV. Smooth clean lines mean this media server will sit nicely with the rest of your AV equipment. Surf your entire media collection from the comfort of a sofa and find an incredible amount of entertainment available on line from news sites, music sites and youtube (for example). Simply a must have gadget for any lounge AV setup and available now to you at a fantastic Chinavasion only price..
Media Format Compatibility: FLV, AVI, MPEG4, DIVX (4.0), XVID, JPEG, MP3, MOV, QT, RM, RMVB, WMA, VOB, DAT, MPEG1, MPEG2, etc. If you wish to make comments or reviews about this product, login and use the product review box. Please open an inquiry ticket if you have any questions regarding this product.